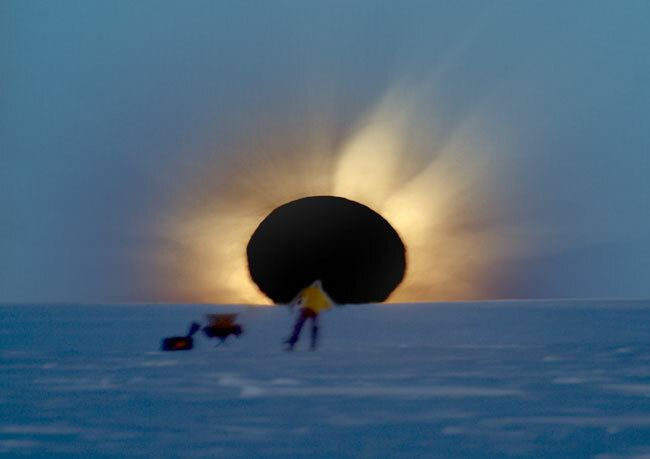 Explanation: The Sun, the Moon, Antarctica, and two photographers all lined up in 2003 Antarctica during an unusual total eclipse of the Sun. Even given the extreme location, a group of enthusiastic eclipse chasers ventured near the bottom of the world to experience the surreal momentary disappearance of the Sun behind the Moon. One of the treasures collected was the above picture -- a composite of four separate images digitally combined to realistically simulate how the adaptive human eye saw the eclipse. As the image was taken, both the Moon and the Sun peaked together over an Antarctic ridge. In the sudden darkness, the magnificent corona of the Sun became visible around the Moon. Quite by accident, another photographer was caught in one of the images checking his video camera. Visible to his left are an equipment bag and a collapsible chair.